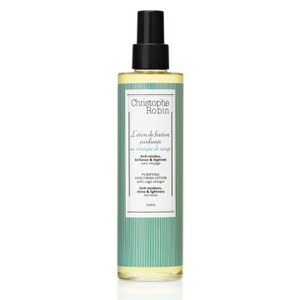 Brighten up your blonde with Christophe Robin Blonde Finishing Lotion with Fruit Vinegar, a leave-in treatment enriched with beneficial fruit vinegar and a subtle scent. With hydrating, reparative and brightening properties, the restructuring formula works to liven up colour intensity, clarify for a brilliant blonde tone and rid the hair and scalp of impurities and product build up. Delicately perfumed, the lotion will leave your hair looking and feeling healthy and balanced with greater colour luminosity and shine. Can also be massaged into skin for a gentle fragrance. - K.N.